A portrait of Alexander Hamilton by John Trumbull, 1792. The Federalist Party (or Federal Party) was an American political party from 1792 to 1816. The Federalists controlled the federal government until 1801. 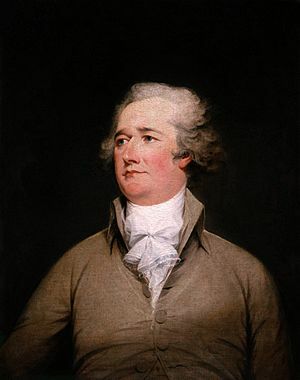 Alexander Hamilton formed the party during George Washington's first term. 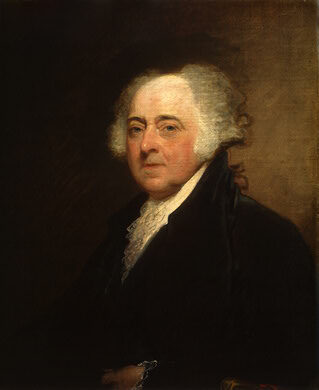 Hamilton built a network of supporters for his financial policies. Many supporters came from cities. These supporters grew into the Federalist Party, which wanted a fiscally sound and strong nationalistic government. With the start of the new government under the Constitution, President George Washington appointed his former chief of staff, Alexander Hamilton, to the office of Secretary of the Treasury. Hamilton wanted a strong national government with financial credibility. By 1790, Hamilton started building a nationwide coalition. He and his network of treasury agents tried to link together friends of the government, especially merchants and bankers, in the new nation's dozen major cities. His attempts to manage politics in the national capital to get his plans through Congress, then, "brought strong responses across the country. In the process, what began as a capital faction soon assumed status as a national faction and then, finally, as the new Federalist party." The party opposed the War of 1812 and dwindled away after the war in 1816. Hamilton and others published a number of newspaper articles from about 1790, which are known as Federalist Papers today. The Apotheosis of Washington, as seen looking up from the Capitol rotunda in Washington. Federalist Party Facts for Kids. Kiddle Encyclopedia.